To trace the history of the tattoo machine, we have to go back to the early 1800s. Back to the time before Samuel O'Reilly patented the tattoo machine. Back to the time when Volta, an Italian inventor, developed the electric battery. All early tattoo machines and their prototypes were battery operated. 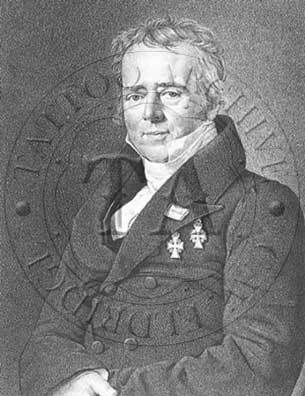 The basic electrical principle of electromagnetism, discovered in 1819 by the Danish inventor Oersted, has been used in all tattoo machine patents and in most practical applications of tattoo machines. 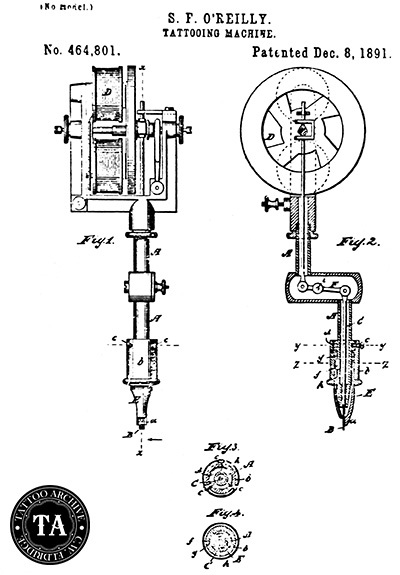 In 1891, Samuel O'Reilly filed is famous tattoo machine patent. It is true to say that O'Reilly's was the first full-fledged tattoo machine patent, but before this there was considerable development in electromagnetically powered puncturing tools. In 1876 Thomas Alva Edison of Newark, New Jersey, received a patent on a device designed to ease the workload of office secretaries. This patent was for a rotary type electromagnetic machine that was battery powered. The machine was designed for making stencils of letters, flyers and the like. The stencil pen would punch holes in the original document and then with an ink roller, copies of the original could be made. This method of stencil transfer is still used today in the sign-painting industry. I don't think one needs to look too closely at the mechanical drawing of this machine to see that it could easily be adapted to tattooing. Samuel O'Reilly certainly did and saw the future in this too. Fifteen years later, with only minor modifications of Edison's design,O'Reilly received the first U.S. patent for a tattoo machine. The O'Reilly modifications included a redesigned tube assembly and an ink reservoir. Thomas A. Edison (1847-1931) was one of America's most prolific inventors. During his lifetime he received more than 1,000 patents for such things as the stock ticker, telegraph systems, the phonograph, incandescent lamps, and the kinetoscope, which was the forerunner of the motion picture projector. Edison was obviously not satisfied with his early stencil pen design, because in 1877 he developed a new idea and received another patent on this device. This machine was quite different from the original rotary machine. The 1877 patent was for a two electromagnetic coil device with the coils set transversely to the tube assembly. A flexible reed vibrated over these coils and created the reciprocating motion needed to make the stencil. Looking at this machine, it is obvious that it could readily be turned to tattoo applications. This device truly marks the beginning of the development of the machine that most tattoo artists use today. In 1904, Charlie Wagner of New York City, received a patent for a tattoo machine. Many historians believe that O'Reilly was a major influence on the development of this machine. However, by looking at the original patent drawing, you can see that both Wagner and O'Reilly referred to the Edison design. It is easy to understand how early inventors were inspired by Edison, especially those like O'Reilly and Wagner, who lived in the same part of the country. Edison would travel from his New Jersey workshop to New York City to show his inventions to the public. His work was well known. Wagner, O'Reilly, or whomever it was that made the modifications to the 1877 Edison patent, did a good job of altering it for tattooing applications. Some of the alterations included improved tube assembly with ink chamber, an on and off switch, stroke adjustment, and a pin vice type needle bar. In 1929 Percy Waters of Detroit received a patent on the design that most people think of when they think of a tattooing machine. Waters was not the first inventor to work with this design. Unfortunately the true originator's name is lost in the obscure annals of tattoo history. Waters' machine was the standard two coil electromagnetic style, but the coils were set in line with the frame. Other modifications included fingertip on and off switch, spark shield, and a needle set up for cutting plastic stencils. During the many years of his supply business, Waters manufactured and sold many different machine types and styles. Waters seems to have been the only early tattoo machine inventor that was able to turn his patent into a marketable item. 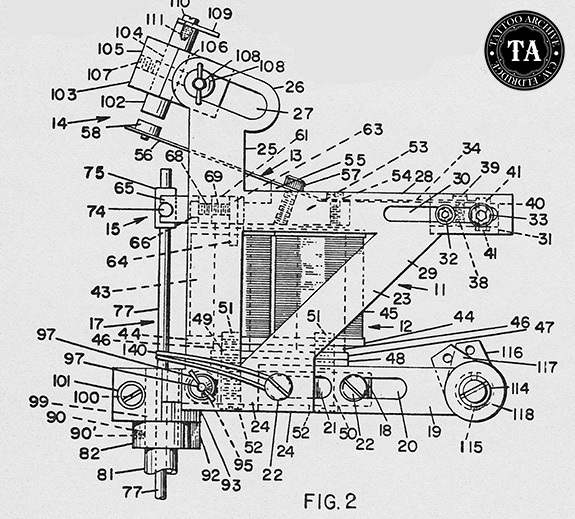 It was fifty years before the next tattoo machine patent was registered. This patent was issued in 1979 to Carol Nightingale of Washington D.C.
As you can see, Nightingale built quite an elaborate device. A few of his many alterations included full adjustability of coils, back spring mount and contact screw, leaf springs of different lengths for different types of work, and an angled armature bar that did away with the bend in the front spring. You can see that the machine has gone through many changes in the hundred years since Edison started his tinkering with the stencil pen. No matter how many modifications occur, a perfect machine for every artist will never be built; all tattoo artists will alter the standard machine to fit their individual needs and applications. Tattoo machines are a very personalized tool. No two are the same. In the U.S. and Europe many inventors still work on tattoo machine designs. Most of these inventors will not file to receive patents on their designs often because of the time and money involved, or perhaps due to the lack of an original design. In theory, each time an improvement is made to the design, the tattoo machine evolves into a better tool. Sometimes the changes are not improvements at all, and the applications of these modifications are short lived. As with any new development, there is a process of trial and error. Often, what looks like an improvement to one person is a hindrance to another. And the search goes on.